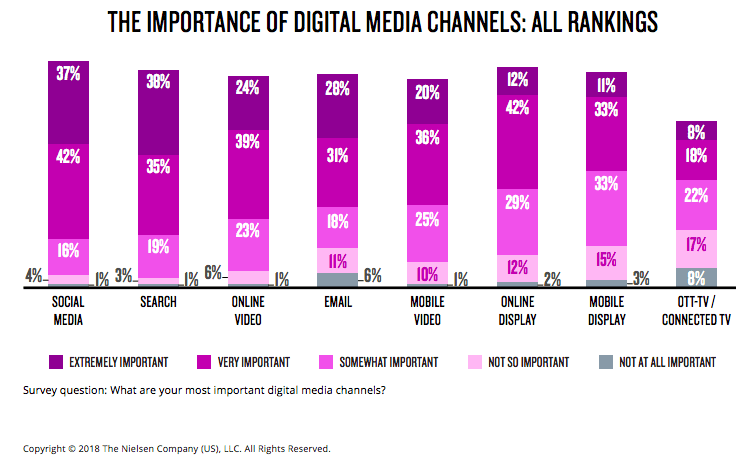 [Chart of the day] What are the most important marketing channels for CMOs' and the best digital channels for measuring ROI? When it comes to online vs. offline marketing for generating revenue and increasing sales, the most important media channels for CMO's (from automotive, consumer packaged goods, retail, telecommunications, technology and travel industries) according to Nielsen, were social media 79%, search 73%, online video63%, email 59% and mobile video 56%. Unsurprisingly, offline media channels appear to be the least important with out-of-home 20%, radio 23%, print 25%, and direct mail 25% ranking the least important of the 13 media channels, with only 4% of CMO's who considered Out-Of-Home to be extremely important for their organisation. Wonderful, -but is it SMART? Why does social media outrank billboard or bus shelter advertising in terms of importance for CMOs? A wild guess is that the one is more measurable than the other, and therefore much better for calculating ROI. 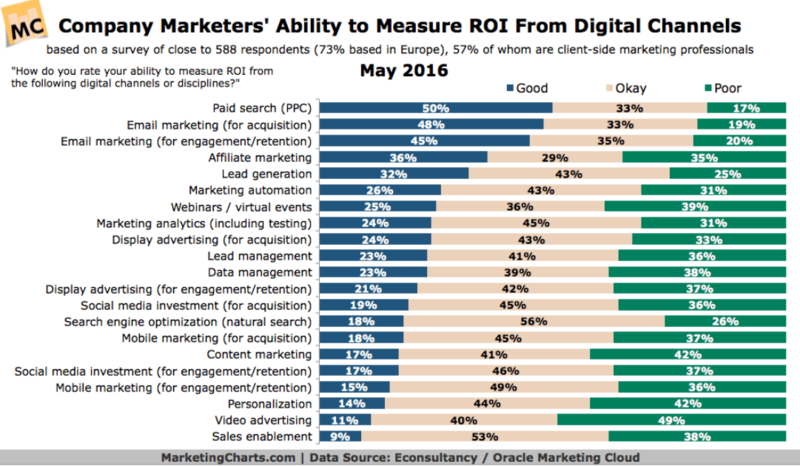 The chart below ranks marketers' ability to measure ROI from digital channels and demonstrates that PPC, email marketing, affiliate marketing, and lead generation were the best digital marketing channels for measuring ROI in May 2016. I'm yet to find a chart for 2018, but the data above likely still holds true for today, although according to Nielsen, digital media as a category is now composed of a variety of distinct media types, such as search, social media, online video, OTT (over-the-top) TV/connected TV (CTV), mobile video, email, and online display advertising. 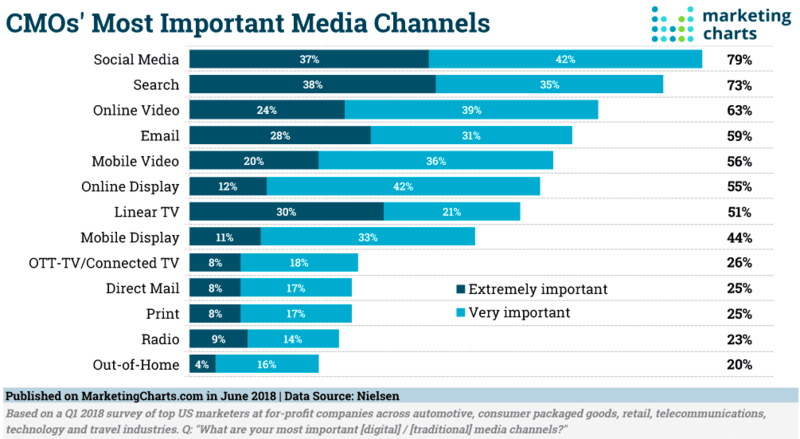 According to Nielsen's CMO report, marketers rated social media, search, email, video and online display as the most important digital channels in 2018. With zero-based budgeting and increasing revenue-and-sales targets, now is the best time to demonstrate bang for each penny spent, with actionable insights, -only really possible through digital and predictive analytics. Local SEO is the process of optimizing your online presence to bring in the most relevant, local customers Local SEO is absolutely core to the success of many businesses. While lots now operate online, most businesses need their local customers …..